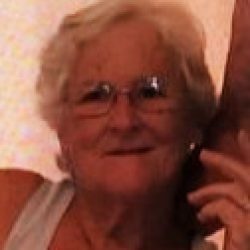 Artimecia “Artie” Ann Tyrrell, 77, of Colonial Beach, passed away in her home on March 17, 2019. Artimecia was born on April 22, 1941 in Harford, Maryland to Marvin Luther Hughes and Viola Audrey Hughes. In addition to loving her family, she enjoyed gardening, fishing and crafting. She was retired from Food Lion as a customer service manager. She had a nurturing hand and cared for the local ducks, geese, swans, squirrels and birds that came to visit. She loved to bake and was recently known as the “Zucchini Bread Lady” at a local produce stand. She was preceded in death by her husband, Eugene Conrad Tyrrell and her parents, Marvin Luther Hughes and Viola Audrey Hughes. She leaves behind her daughters, Deborah Ann Thompson and Patricia Lynn Butts (William Nalett); her sons, Edward Eugene Tyrell (Susan Zolbe) and Michael Eugene Tyrrell; siblings, Nevin Hughes, Guy “Bill” Hughes (Marlene), Jackie Dalton (Arlie), Joseph “Dink” Hughes, Ted Hughes (Patsy), and Marvin “Shag” Hughes (Irene); grandchildren, Christina Pilley (Scott Tremblay), Billy Holt, Amanda Dixon (Blair Hensely), Jason Dixon (Kristen Dixon), Brianna Tyrrell, Heaven Thompson, Rachel Tyrrell, Stephen Tyrrell, Austin Thompson, Korinna Thompson, Thomas Tyrrell and Timmy Tyrrell; great grandchildren, Garrett Pilley, Kaylei Dixon, Evan Tremblay, Bhentley Matthews, Alia Thompson, Jensen Thompson, Oliver Hensley and Kylie Rice; and numerous nieces and nephews.